Here we showed you how to make your own rose water. Now, how about some more ideas for how to use it? Combine ingredients in a spray bottle and shake. It's ready to use. Spritz on a little to help your makeup last all day. Combine ingredients in a spray bottle, shake and spray. Your hair will be smoother, shinier, and it will smell great. Mix all ingredients. Apply to face and leave on for 15 minutes. Maybe you can lie back and listen to a podcast while your skin becomes refreshed and softened. Rinse and enjoy. Honey can make your skin glow, clear your pores, and slow down aging with its antioxidants. Almond oil is known for moisturizing, calming, removing dark circles, and reducing wrinkles. Vitamin E oil is another wrinkle-fighter and dark circle remover, along with healing scars and remedying dry skin. Grind the oats in a food processor so they'll stick to your skin more easily. 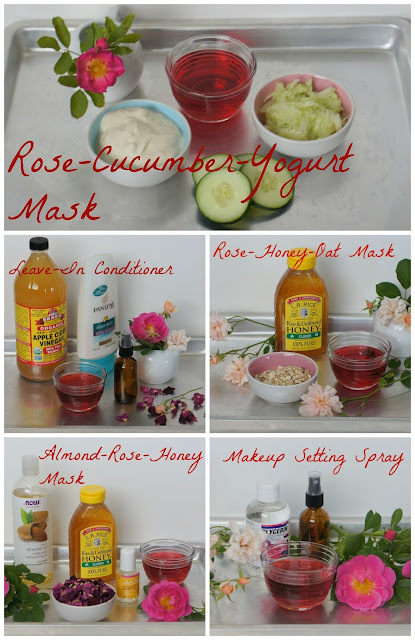 Then mix with the honey and rose water and apply to your face. Ideally, you'll lie back with rose water-soaked cotton rounds over your closed eyes and relax or meditate. Leave on for 5 - 15 minutes; gently massage into skin before rinsing. Oats are soothing, gently exfoliating, and contain antioxidants. Mix all ingredients. Apply to your face, place cucumber slices over your closed eyes, and leave on for 15 minutes. After rinsing, your skin and eyes will be moisturized and perked up. Yogurt moisturizes, dissolves dead skin, tightens pores, reduces discoloration, and minimizes breakouts. Cucumbers help reduce dark circles, puffy eyes, tighten pores, fight wrinkles, and soothe skin irritations. I hope you'll try some recipes today and enjoy your great-looking, great-smelling skin and hair!